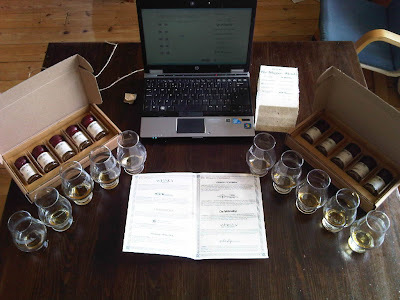 In the 21th century, where having a whisky blog can get you friends in 7 continents, samples in the post, interviewed for "real" publications, on a judging panel, or even lead to a job in the whisky industry (! ), you wouldn't be on crack if you decided to start one yourself. And I can observe that the world wide whisk-e-verse has exploded since I began in 2006, when Dr. Whisky had only 4 English language "blogs" to link to and NONE that offered what I thought I could share: a dram a day, distillery descriptions, stories from books I had trawled, distilleries I had visited, and people I had met, an international persepctive, irrational and heated opinions, and of course some colourful tasting notes. Today, after some deletion and MANY additions, there are nearly 25 times as many links on my "Get informed by others" sidebar as there was when this Malt Mission began January 1, 2007. Of course, all of the others involved in this project are listed among many other amazing online resources. The world of whisky is the warmest community I am fortunate to be part of outside of a Saturday morning in bed with my wife and daughter, and if you are reading this, I raise a glass to you for loving Scotland's greatest gift to the world. As a very 21st century retailer, Master of Malt invited 10 leading blogs to participate in creating their own blends by sending them kits of the constituent liquids, beakers, pipettes, and an excel doc for recording recipes. Recipes were submitted, blends assembled to spec and then offered up as a sample pack on the MoM website for £30. With the purchase, of course, came the responsibility to vote on your favourites by assigning them 1st place to 10th place. The kits are now completely sold out. In creating my recipe, I trialled 10 vattings and let them marry for many days in bottle before re-sampling and deciding which one to submit. And it was a hard decision! Depending on the percentages of each part (highland, grain, old grain, old highland, etc. ), the value/cost of the liquid would change, so we each had to weigh between whether to make a blend built around desired cost or to make a blend based on taste. Somewhere in between? When deciding which to submit I was torn. Do I go with the cheap and cheerful blend? The expensive one? The quaffable one? The smoky demon? The sweet grainy one? The one I could spread on toast? Likewise, selecting a favourite of all the submitted blends was a real challenge and a reminder of how with the flavour palate a commercial blender has at their disposal, the room for variation, and indeed, error, is vast. So creating a good, consistent blend is a skill for which I continue to have the utmost respect and that art and skill is, after all, what allows the whisky world to be what it is today. Others involved have reported their experiences (Whisky For Everyone for example). Did you buy one? I'd love to hear your thoughts on the whole thing. Whatever the result, all the blends were highly drinkable with a few being truly stellar, and while each blender deserves kudos, the good people at Master of Malt deserve respect for not just dreaming up, but for actually executing such a project. Nice work, and until the results are announced and I press "confirm order", cheers! Wow lucky man, shame my blogs don't get such great freebies! Maybe i'm in the wrong field. Doc, do you think this bottling will be worth buying once it is released? nice article...I wish you good luck in this competition, are there any results ready? JR- As long as it costs closer to £50 than £100, then yes. Absolutely. Christian- Results are in, Master of Malts and the bloggers are just working on names, package, etc. TJ- I have enjoyed everything I have had from High West. Really nice people, too! Great whiskyblog - looking forward to enjoy it myself.